Big brother tracking via mobile phones to be rolled out across London - Nothing to Hide? 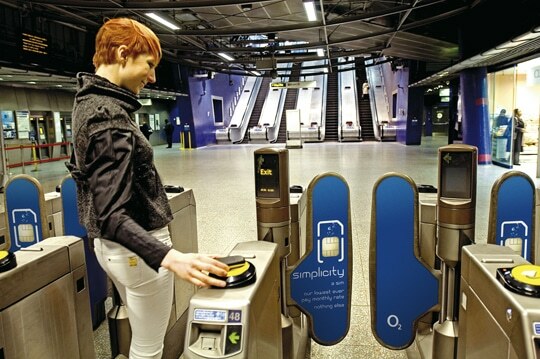 Londoners today should be in a grip of panic, after the controversial testing between O2, Barclaycard, Transport for London (TFL) and Nokia was given the green light, as reported by the London Evening Standard. Being marketed as the “O2 Wallet”, the Nokia 6131 NFC (Near Field Communications) mobile handset is linked technically to an OysterCard, the cashless systems used across London’s travel network, along with ‘Wave-and-Pay’, the wireless payment systems introduced by Barclaycard Visa. All are using RFID (Radio Frequency Identification) back-end – and connected to the individual via a uniquely identifiable transmitter chip enabled on the back of a SIM card in their mobile phone. In trial on 500 handsets since November 2007, benefits have been in being able to travel throughout London just via their mobile phone as well as providing the ability to purchase small items (under £10) in shops supporting the scheme, even book tickets and physically enter venues past security, all from a single device. No other cards required the need to carry a leather wallet and tattered tickets, notes and pocket full of change is being shown to be a thing of the past – a welcome appeal to most men no doubt! At least that’s what the hope of and marketing fluff of the proponents behind the technology will suggest. The most sinister of things masquerade as an angel of light, and this is no exception. 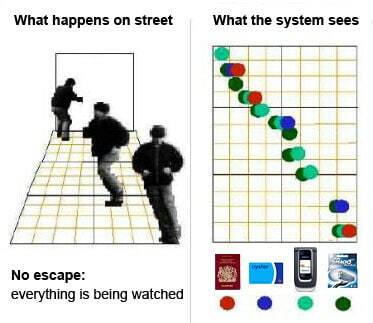 Mobile phones are the trump card in tracking citizens as they are being carried continually by choice, unlike a passport. The personalisation of each device from covers to ringtones is what has brought appeal to adoption alongside the communication services it facilitates, combined with the desire of owning the latest cool gadget such as the iPhone. Supporting a unique ID number on every single RFID chip, the mobile therefore becomes enabled with a personally identifiable location-beaming system that can be read as far away as 300 feet plus, depending on the level of reader/transmitter in operation. It is a key stage in ushering in a personal identity card, right under the noses of the most astute advocates of privacy. Most modern phones already are adopting GPS (Global Position Systems) revealing their location on maps charting their journeys (the iPhone even records locations of where photos are taken), and along with triangulation (working out location based on proximity to a phone mast), it is possible to narrow down someone’s relative location now. However, both require the device to be switched on. RFID does not necessarily need power and so is never switched off. It has an aerial surrounding a chip that can be picked up by a reader – whether low-strength such as the OysterCard readers in buses and tube stations or by more powerful readers allowing greater distances between chip and reader, such as those on door frames in shops or the overhead readers on public roads. From Razorblades, to DVDs to car number plates, RFID is the most invasive barcode for the future allowing each and every item, and not just groups, to be singularly tracked from production, to purchase, to refuse – without the need for a line-of-sight scan, like infrared and bar-codes currently. All items using RFID are connected via the internet and continually transferring personal actions and locations, providing streams of data for someone to track legitimately (!) or otherwise revealing a comprehensive monitoring of habits, communications, purchases and pure real-time visibility to people’s physical location. Which products are where in a shop, street or home as well as who has what and where is all able to be interpreted on screen by anyone with ability or desire to do so. With proof of purchase needing to be able to be tracked, despite the wide-spread belief of RFID being disabled upon leaving a shop, this is simply not the case. In short, it is the most detailed diary of someone’s life written on web pages that few will realise exist, and being able to be read by anyone with a vested interest in doing so; government, stalker or thief alike. What is snide about this marketing concept is that many will see immediate benefits and adopt to the technology without thinking through any particular consequences to their personal privacy or where this will ultimately lead to. To most the change will go un-noticed, to others convenience and cost-effectiveness will be the means to justify an erosion of public and private privacy which, as Oystercard has already proven with adoption by 10M Londoners, people are happy to trade given sufficient PR spin. One third of the population of the world carries a mobile phone, twice as many as those currently connected to the internet. When you consider mobile internet is being rolled out on more handsets, the growth of internet adoption can be doubled very quickly along with the scale for personal tracking on global proportions. It has not escaped noticed of those in office. Britain already has RFID enabled passports, required for border control. Many countries require you to carry an identification card continuously. Toll roads such as the M6 in the UK have been playing with RFID car monitoring for years, negating the need for traffic cameras as they are monitoring every movement of the car. DVLA has already conducted trial of RFID-enabled e-license plates to be fitted on cars holding vehicle tax, registration and road-worthiness information linked to personal car insurance. From Tesco’s to Curry’s to Superdrug – everyday items in your shopping basket are being tracked and transmitting their positions even as I write. Coupled with the proposed change in UK law over tracking all transmitted communications, verbal and written, this will create a spy-state being able to see where a person is at any moment in time – whether in personal or public transport, what they are up to, what they own , where it is, who is communicating with whom and about what. It is the total erosion of privacy; endorsed by government, backed by business and facilitated through technology. I, for one, am very, very afraid. This is a complete abuse of trust, mobile phone networks should not be party to this type of abuse. If they are, then the public should be encouraged to boycott these companies. This is not a service, it is big brother, there is no need for the use of such technology. I think the issue is a bit more complex. Even though in theory the government could track our every step, our every purchase, even what we watch on TV or listen to on the radio, the websites we look at, the emails we send and a lot more – a lot of the information is still spread across different organisations and would need to be brought together to give you the full picture. Big Brother would either have to hack into the Tesco system to get your shopping details or ask for permission officially and legally – and so far there this has only been asked for with respect to communications, that is phone calls and your internet browsing. I do agree that Britain is becoming more and more big brother and a lot of measures are being introduced under the cover of being there to help us. My favourite example is the fair road taxing idea whereby all our cars are tracked by satellite so that we only pay as much tax as we use roads for. Now that sounds like a wonderful idea that will mean we are all going to be more careful about how much we use our cars. However, even though the government says that no detailed information would be kept, the technology would easily allow our cars to be tracked constantly – and that is very worrying. Couple that with the latest anti-terror laws, which allow anyone to be held for a number of days without charge for example, and you start to get really worried. However, despite there being more and more Big Brother technology in use today and our rights as citizens being curbed further and further, I still don’t think we’re quite there yet. I still believe in a democratic system whereby we, as citizens, need to make our thoughts clear to our government and ensure the proper measures and laws are put in place to prevent us being tracked legally – and that any undercover organisations, such as the secret services, are also properly controlled. We can’t sit there and complain. We have to act and use our right to vote, write to our MP and do everything we can within our democratic structure to ensure Big Brother is being watched himself.